Posted in Healthy Home & Garden on June 24, 2012. Last modified on January 31, 2018. Read disclaimer. June 24, 2012 - Since purple sweet potatoes offer a lot of the appeal of regular potatoes (we love them as oven-baked fries and mashed) but have more vitamins, we got excited when we saw them at our local health food store. Unfortunately, they were awfully expensive ($3.99/lb, I believe). Apparently, if you want to grow them in your garden, you're supposed to order slips from a nursery. 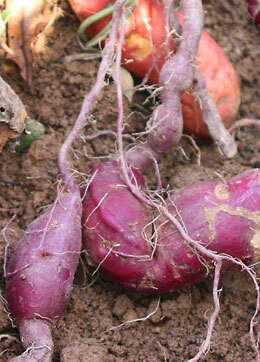 Since we've had pretty good luck sprouting, cubing and planting regular potatoes, however, we decided to take the same approach with purple sweet potatoes. 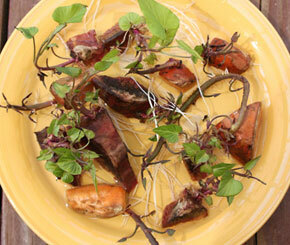 (We included some regular sweet potatoes as a backup). October 8, 2012 - Talk about low maintenance, the vines are so thick that weeds are not a concern. And, because our rains have been pretty consistent, we've watered the sweet potatoes only a couple times. Next year, however, we will allocate a lot more room for the vines to sprawl since every vine sprouts roots, which I assume could produce more potatoes. 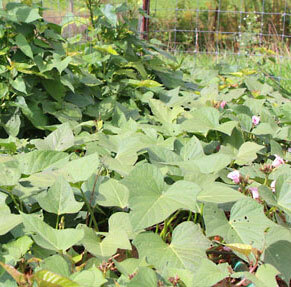 From what we've read, we'll want to start digging 'em up quickly after the first frost since the sweet potatoes begin to rot quickly after the leaves die off. 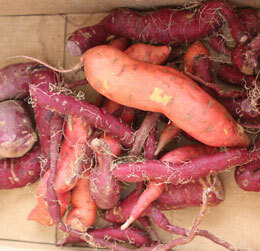 October 18, 2012 - Sweet potato harvest begins! Potatoes eaten by voles... or rotted.. or nothing but roots... we didn't know what to expect. What a relief to see purple when we uprotted the first couple plants! Below is what we got from the first 4 or 5 starters.